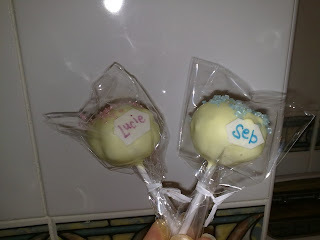 Well, it's fast approaching my first anniversary of making a cake pop and I thought I'd share the story and the recipe that first got me started. You'll see my very first makes, and my transition from rank amateur to seasoned professional - hee hee! What to know something interesting? 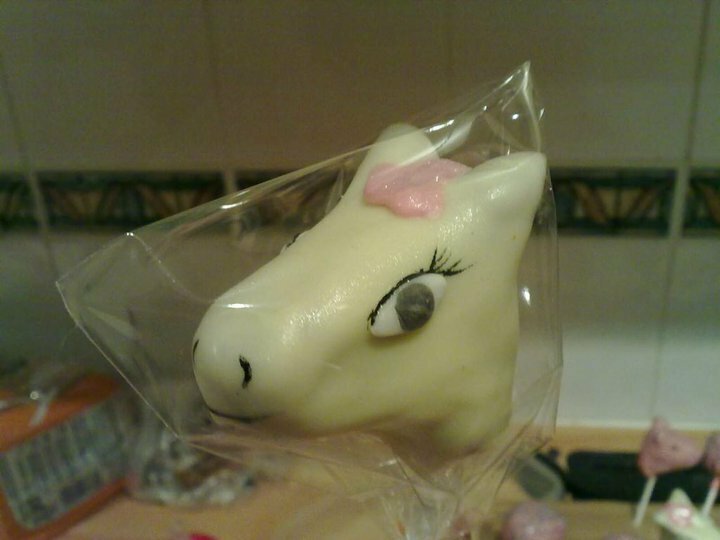 I'd never heard of Bakerella when I first made cake pops. My very first time was making these from a program I watched and that's why I don't use frosting in any of my pops - I completely changed the recipe to suit my own needs and to create the other flavours I do. My 'Rich Chocolate' doesn't really look like this any more, but it most definitely was the basis for it. It's worth a try as it's so delicious. VERY rich though! I uploaded a picture onto Facebook, and my friends suggested that I go into business. I was skeptical at first, but a friend asked if I could make them look like ponies and I said I'd try. My very first order! 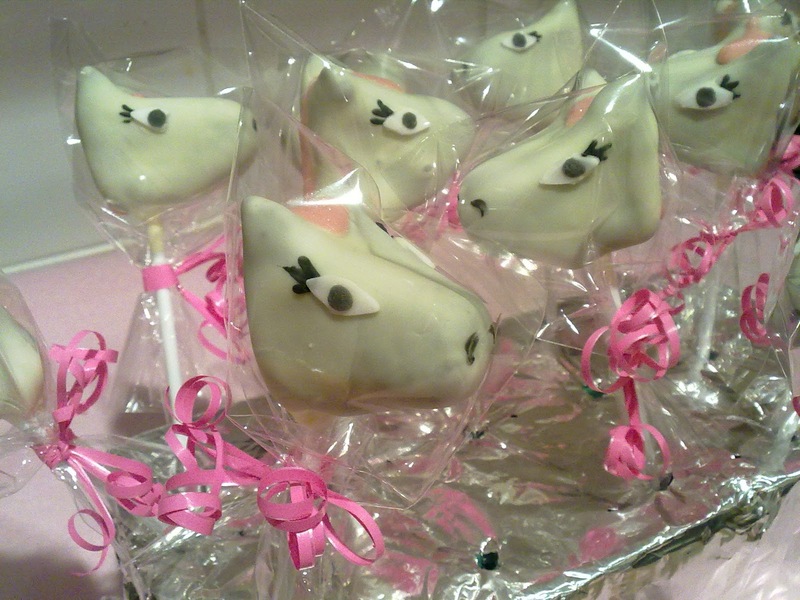 It was then I discovered the amazingly creative world of character cake pops and I was well and truly hooked. Well, the ponies didn't come out too badly, they're not perfect but I was well on my way. I couldn't possibly use the recipe below for the toddler-recipients as it's just so rich, so I had to work on a new version. When I look back at them now, I have to admit that they were a little dry and probably not that flavoursome. The kids loved them but they weren't quite ready for the masses. Pony pops - final version! 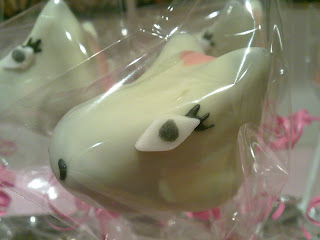 When I first started I was using white chocolate, as that's what the original recipe had called for. Let me tell you something: white chocolate (from a supermarket) is a NIGHTMARE to work with compared to candy melts or coating wafers such as Merckens! It's really runny, it drips a lot, it takes a lot of colouring to make bright and bold colours (and when you first try to colour it you don't realise you need oil-based colours so you inevitably waste a whole bowl of chocolate using normal food colourings!). It was December when I first got to try Wilton's Candy Melts, and I knew they were the right way to go. My first time was very frustrating, as they were just SO DAMN THICK. I hadn't realised that you were supposed to thin them with vegetable oil or paramount crystals, but a google soon sorted that one out for me. You'll notice from the very first pony picture that their painted features aren't very good. I was using powdered colours and rejuvenator spirit, and they were watery and they smeared on the bag. For the second attempt, I mixed the powdered colour with the white chocolate and did them that way. After a few months of using very expensive Confectioners Glaze aerosol spray, I wondered if there might not be a better way. I found some leaf glaze on Ebay and asked if I could paint with it. As far as the seller and the manufacturer were aware, the answer was a resounding 'no'. I decided to experiment and bought a bottle - the best decision I've ever made. Suddenly, it was possible to paint in the entire rainbow of colours, with no smearing on the bag! In case you're wondering what the difference between Leaf Glaze and Confectioner's Glaze is, I think the leaf glaze is a bit more watered down. You can add IsoPropyl Alcohol (rejuvenator spirit) to Confectioner's Glaze to get the same thing. From there, it was just a question of practice makes perfect. I've made hundreds of different designs since then, some most definitely better than others! I put a lot of love into my pops and I always try to be original. Sometimes I might do my own version of someone elses creation, but I always try to credit the original artist and put my own spin onto things. I don't want to be the same as anyone else. I just want to be me. 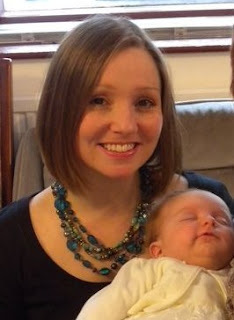 And in case you ever wondered what I look like - here's me at the christening last year, shortly before serving up those very first cake pops. I probably look 100 years older now, cake popping does that to a person - hahahah! So, there you have it: my cake popping story. If you'd like to start on a cake popping journey of your own - why not start with the same recipe that got the ball rolling for me? Recipe taken from the BBC website. in the fridge for 20-30 minutes, or until the chocolate has set. Always love reading your blog and seeing your new creations, but particularly enjoyed this one! It's nice to see where you started and to put a face to the name! You are so talented I hope one day I can make cake pops that look as good as yours! Do you have an artistic background? And is this now your full time job? I was a high-end travel consultant before I had my 2 children (now just turned 1 and almost 3) so not really the same field by a long stretch! However, I've always been a bit creative - I love to make cards, I used to faff about with jewellery, and if I had time I'd totally learn how to sew. I do work full time, with an assistant to help a couple of days a week. Having your own business from home is hard though, as you never switch off. Any time on the laptop is spent answering emails and enquiries, I just can't stop myself. I wouldn't change a thing though - I love my job! Maybe I should share some more of my earlier makes in the next post. Some are pretty terrible! It's a slippery slope, Annie. It always just starts out as for friends and family, and then it's friends of friends, and then you create a Facebook page, and then a website, and before you know it, you're working 60 hours a week! And thank you. I think youv'e done a fine job! It's nice to see how far you've come...gives me some hope for my skills! Practice makes perfect..right????? lol! Hey Bianca...I only found your blog a little while ago...so I'm a new reader, but of course I 'like' you on facebook! As you may know I make some cakepops too...so I know how fiddly they can be... and I only make very simple ones!